For the project, CNR brought in 100 Cornish Rock chickens as day-old chicks, and monitored their growth over the next two months. To provide a proper living space for the chickens that also fulfilled the requirements of the project, CNR Dean/Director Tapaau Dr. Daniel Aga collaborated with Trades and Technology (TTD) Dean Mr. Michael Leau, who arranged for the TTD Architecture to draw up the blueprints for the structure under the guidance of instructor Adullum Esera. Gurr and CNR instructor Dr. Otto Hansell used previous research done by the Sea Grant team at ASCC in producing a tilapia feed to produce their own feed which they felt would be more appropriate for broiler chicken production. During the course of the project, Dr. Hansell involved his Agriculture students as an introduction into methods of raising poultry. As the test progressed, Gurr and Hansell noted that the chickens given the locally produced feed reached an appropriate cooking size at approximately seven weeks, which is almost as fast as the chickens eating imported feed. “The commercial feed still was better than the locally produced feed,” said Gurr, “but this was just our first trial. We will be continuing trials to try to improve the local feed.” However, the chickens given the locally produced feed showed no compromise in flavor. “We had a taste test and found them to be good tasting and very tender,” confirmed Gurr of the chickens raised on the locally produced feed. 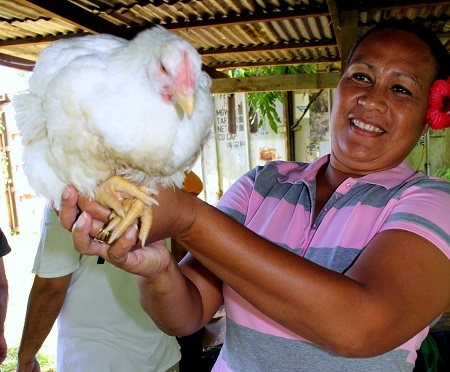 “I don't think we are at the point of producing meat chickens for the same cost as an imported chicken yet, if fed imported commercial feed,” reflected Gurr, “but the development of a locally produced feed which saves farmers the cost of imports has the potential to turn poultry farming into a viable economic alternative.” The ongoing project is partially funded by the US Department of Agriculture – Western Sustainable Agriculture and Education.